"A traditional German favorite that I have loved since I was a child. This recipe is quick, easy, and delicious. Substitute cider vinegar for a different flavor. I prefer to leave the skins on the cucumbers for more texture and flavor, but they can also be peeled prior to slicing if desired. Flavor is best when marinated for several hours before serving." Spread cucumbers and onion on a platter; season with salt and let rest for 30 minutes. Squeeze excess moisture from cucumbers. Stir sour cream, sugar, vinegar, dill, and parsley together in a large bowl. 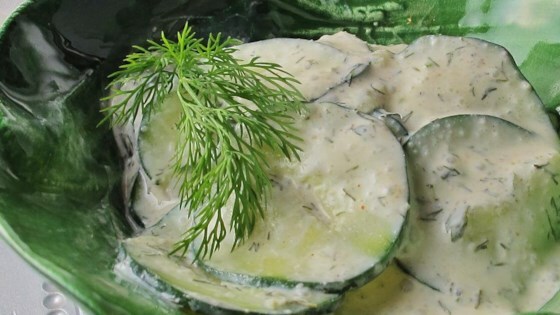 Fold cucumber and onion slices into the sour cream mixture. Refrigerate 8 hours to over night; garnish with paprika to serve. My mom always made a salad like this. (she was from Germany). I've been making it too, but with parsley and chives and a tiny dab of yellow mustard. It's a nice and refeshing summer salad. This was an excellent dish. I could not wait the 8 hours to try it. Once I mixed everything together I ate the whole bowl to myself. Great job! iam german and i love it has a great flavor thank you for sharing.